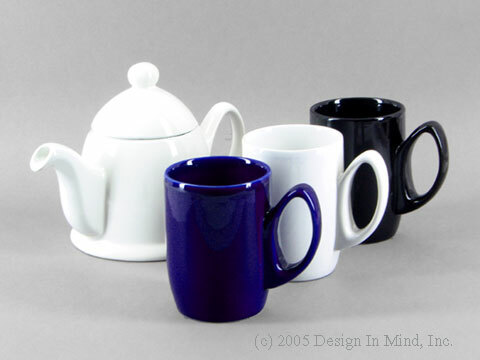 Mugs for home and office in many sizes, shapes, and colors. Our tea cozies are showing up in offices to keep mugs nicely warm when you're away from your cup. Please check our sizing guide for the correct size cozy for your mug. 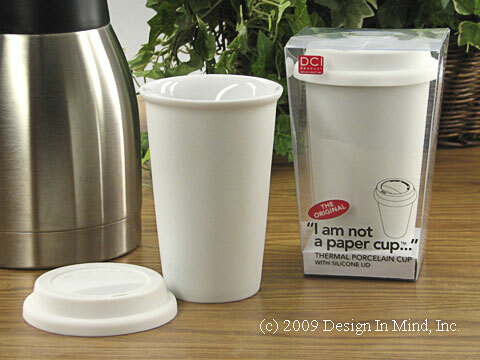 "I am not a paper cup" thermal porcelain cup with silicone lid. Two layers of porcelain separated by a hollow cavity act as a perfect insulator for hot and cold beverages and ensures that you won't burn your fingers. Holds approximately 10 oz. 6" tall. Microwave and dishwasher safe. Cleaning instructions for lid included. Made in China. 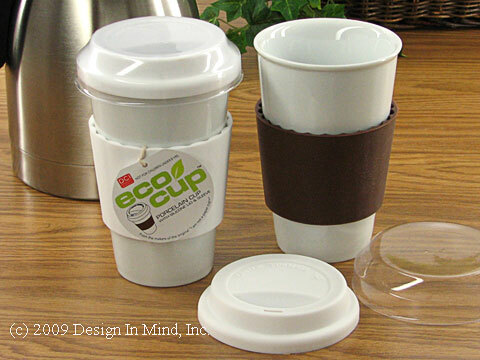 eco cup non-thermal porcelain cup with silicone lid and sleeve (one white and one brown). Holds 14 oz. 6" tall. Microwave and dishwasher safe. 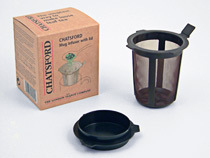 Cleaning instructions for lid included. Not for children under 8 yrs. From the makers of the original "I am not a paper cup" Made in China. Staffordshire Fine Bone China. Set of 4 white bone china mugs. 9 oz. 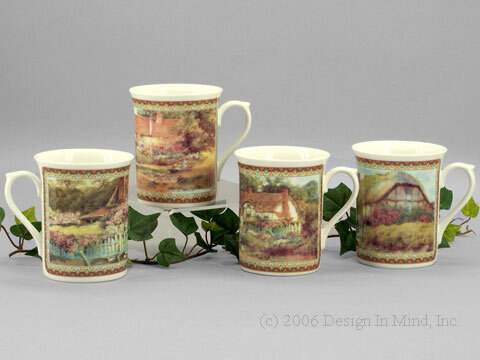 Enjoy 4 different scenes of english cottages in muted pastels. Scene encircles mug. Made in England. Bright Red mug with white interior. Holds 12 oz. 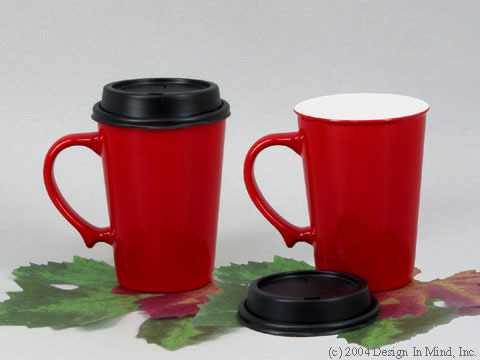 and is designed to accept the same snaptop lid used on many paper cups (not included). Great travel mug for filling at your local coffee shop. Made in China. Sturdy 12 oz. stoneware mugs in three colors. Only black remaining. 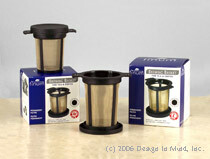 Match the stoneware teapots above or combine with the Finum large filter (see Infusers) for a great tea for one set!. 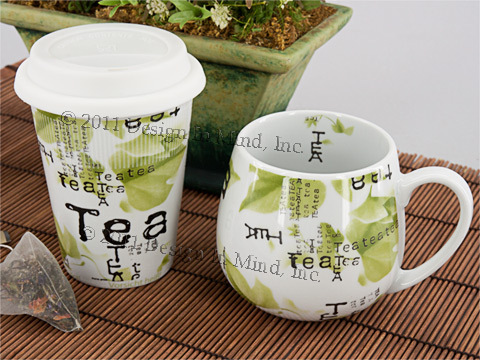 High quality white porcelain mugs with green leaf design and black tea print. Traveler's mug with silicone lid, 4.75" tall, holds 9 oz. Snuggle mug, 3.5" tall, holds 14 oz. Mug is Microwave and Dishwasher Safe. Morning toast, bagel, muffin, scone, or your favorite dessert or treats...you name it. For everyday use or that special occasion. These 6" plates make serving easy and attractive. 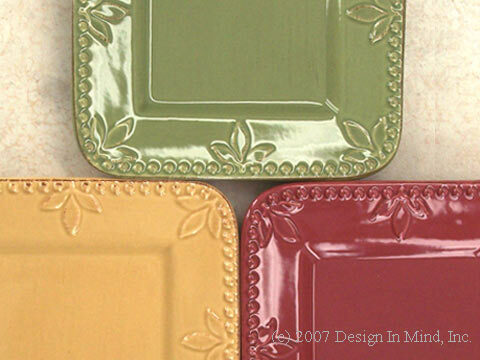 Choose 6 green, wheat or burgundy plates, or a mixed set of 2 of each color. Each set comes with a FREE black metal serving caddy, 10"h. A brown tone brushed glaze on the edges adds that "old world" look. Dishwasher and microwave safe. Plate style and colors coordinate with 14 oz. mugs. 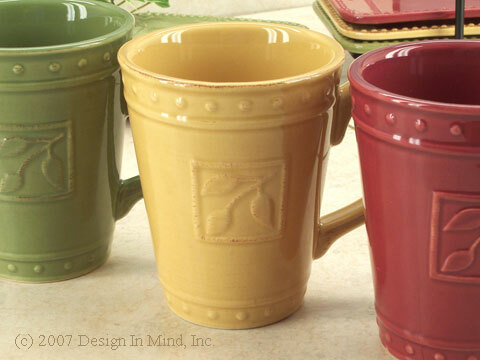 Sorrento mugs in 3 wonderful colors to coordinate with the plate and caddy set. A brown tone brushed glaze on the edges adds that "old world" look. Stoneware. Dishwasher and microwave safe. 14 oz. 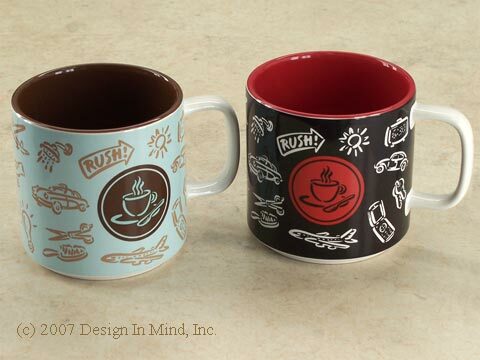 4.75" h.
Before you rush out in the morning, enjoy your coffee or tea in a Rush Mug. 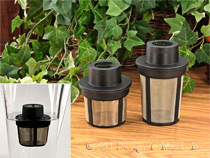 Choose trendy soft light blue w/brown interior or black w/red interior. Dishwasher and microwave safe. 12 ounces. Made of Stoneware. 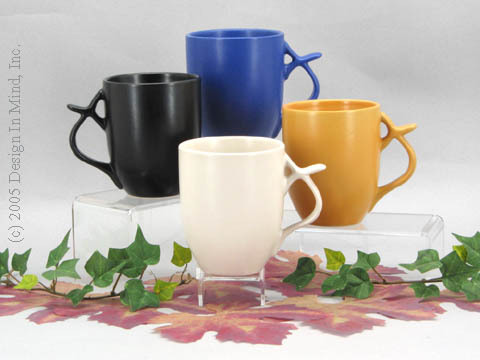 Ergo series stoneware mugs from Highwave. Unique handle design makes this an easy mug to hold that favorite coffee or tea. 10 oz. mugs are available in four matte finish colors. "Mango" design creamy white bone china mugs and plates. Set of 2 mugs and 2 plates. 9 oz. mug, and 8" x 7" plate. Unique shape with clean lines. Microwave & dishwasher safe. Mug and snack plate set in white porcelain. 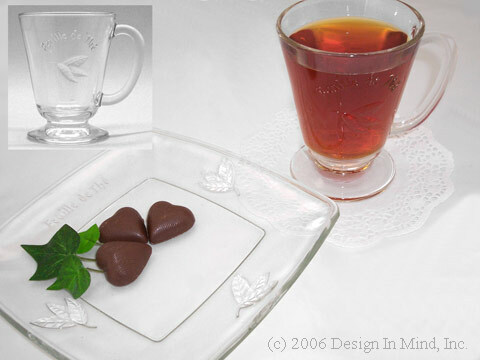 The clean lines on this snack set go well with many tea set styles. The curved mug handle and plate grip make this set very unique. 7 oz. mug, 4"h x 3"dia. 6.5" x 8.5" plate. Microwave & dishwasher safe.